Enlightening (Residential Lighting Blog): Learn More about Lutron Shades! Learn More about Lutron Shades! We have a new CEU class in June. 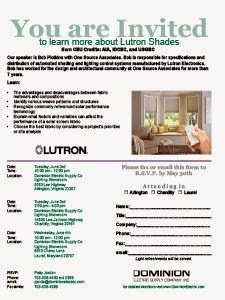 Lutron will present their shade solutions. distribution of automated shading and lighting control systems manufactured by Lutron Electronics. 7 years. We'll also hear from Jeff Cianni, Residential Solutions, Lutron Electronics. Seminars will be held Tuesday, June 3 in our Arlington (10:00 am) and Chantilly (2:00 pm) showroom locations and Wednesday, June 4 (10:00 am) in our Laurel, Maryland showroom. or contact me, Patty Jordan, via email: pjordan@dominionelectric.com.